There are a lot of tutorials online on how to make soap clouds. I love the idea of doing a little science project with kids but I also thought I could make something really cool with these soap clouds. 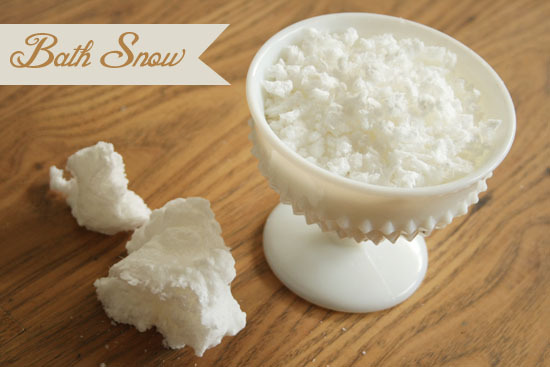 So here is my tutorial on how to make bath snow! Learn how to make bath snow after the jump. . .
– a creamy soap bar. Online I found a lot of people using ivory soap for making soap clouds. I used a cheap brand soap bar, because I couldn’t find Ivory around here, and it worked just as well. Cut the soap in three pieces. Put one of the pieces in the microwave on high for one and a half minute. Don’t put the entire soap bar in the microwave at ones, because it will expand. A lot. This part is great for kids to look at. The soap bar turns into a big cloud of soap! When it comes out of the microwave you have to let it cool down. Wait until its cooled and crumble the soap cloud into little pieces of bath snow.